Maldives tourism has been rapidly changed as it started encouraging eco-tourism and other corrective measures to save environment and its rich aqua life. It is a very unique and special place attracting many colors from different coasts. Maldives is ranking among the most desirable travel destinations in the tropical region. This is because, it is home to large natural reserves and encourages eco-tourism to safeguard the delicate environment and rich marine life. Beach tourists often plunge into its beauty of torquoise waters, white beach sand, unique wildlife and a chance to see its untamed coral colors, desired by many divers and snorkelers that praise its profuse underwater resources. Come fill your life with all that is 'LIFE' and be a part of fascinating and refreshing underwater mountain range with stunning coral reefs on its edge. These small showers of picturesque islands with dense tropical flora and incredible fauna including flowering plants, shrubs and swaying coconut palms surrounded by contrasting white beaches, crystalline lagoons that all makes 'Maldives as paradise on Earth'. Maldives could be the ideal place for you to learn snorkeling, where you can put the mask on your face, fins on your feet and the air-tube in your mouth. With these simple devices you can enter the magical world beneath the surface. Don't be worry about not knowing the sport, our professional tour guide will help you with prior knowledge of snorkeling and guide you to ride the waves. 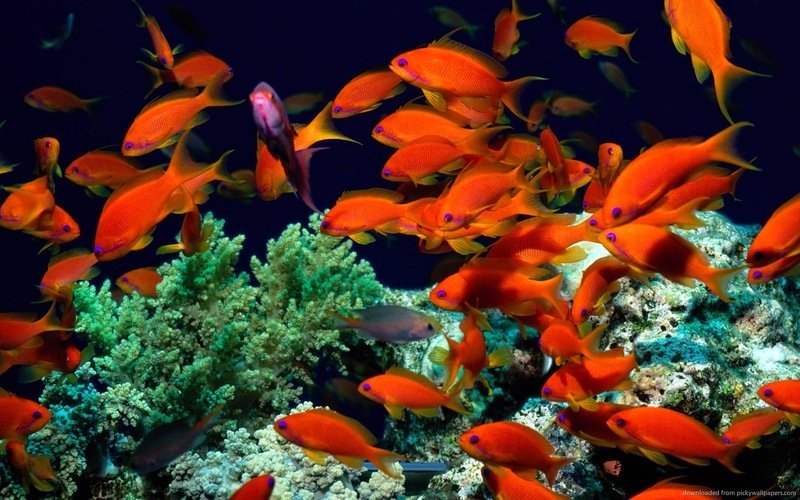 Maldives has emerged as an ideal location for the scuba divers for its magnificent coral reefs and guess what! Whale watching should surely be on your must-list. Whales that can be seen here are from all categories, namely from the large Blue whales to the small dolphins. Another interesting activity, that you will love to participate in, is various water sports which are hosted here for a perfect adventure slide. Maldives are like a magnet for people who love marine life and yes, life in general. Every place has it unique feature and Kanyakumari distinguishes as it is surrounded by three ocean bodies (Mighty Indian Ocean, Bay of Bengal and Arabian Sea) and all this can be viewed from one place. At its beach-side, you can gather multi-colored shells to add in collection of sea-treasure or you can also witness some of the best views of sunrises and sunsets that have pleased many painters from all over the world. Kanyakumari is famous for its temples' architecture and Kanyakumari Temple proves it well. The temple is dedicated to the goddess 'Devi Kumari Amman' and is of great historical and religious significance. 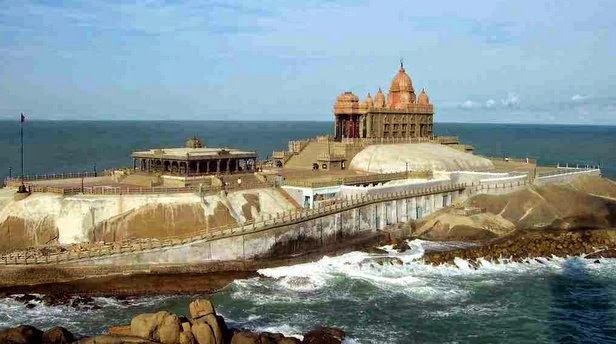 It is the most important among other Kanyakumari temples and therefore comes first in our must-visit countdown. 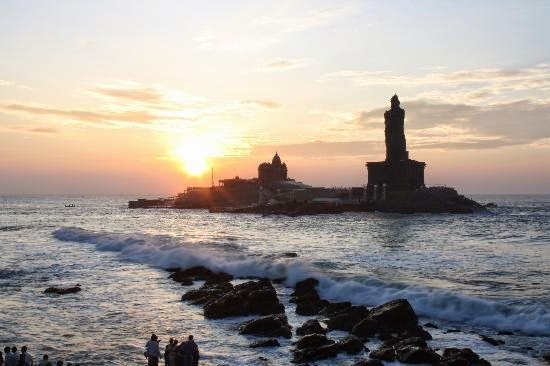 It is one of the best Kanyakumari tourist places located at the con-flux of three huge seas namely Bay of Bengal, Indian Ocean and Arabian Sea. A lighthouse at the beach gives panoramic views of three seas meeting at one that seems like never-ending blue waters. Beautifully snuggled in the southern Kanyakumari is the Olakaruvi Falls, that is an ideal picnic spot. 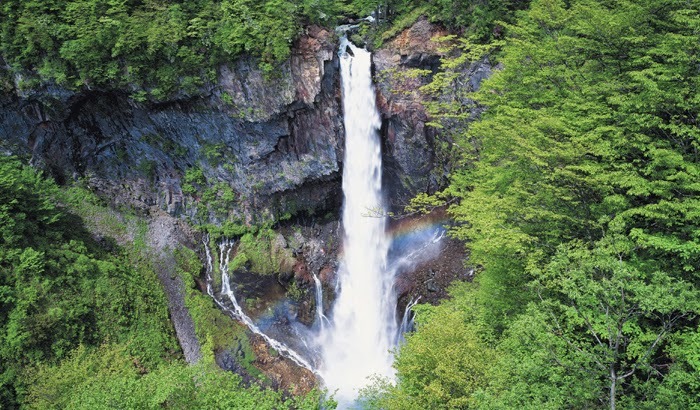 This waterfall consists of two smaller falls – the lower part is a famous family picnic spot and the higher is about 200 mtrs uphill that is best for trekkers. This huge statue is a tribute to 'Thiruvalluvar', the known poet and philosopher, praised for his contribution to Tamil literature. 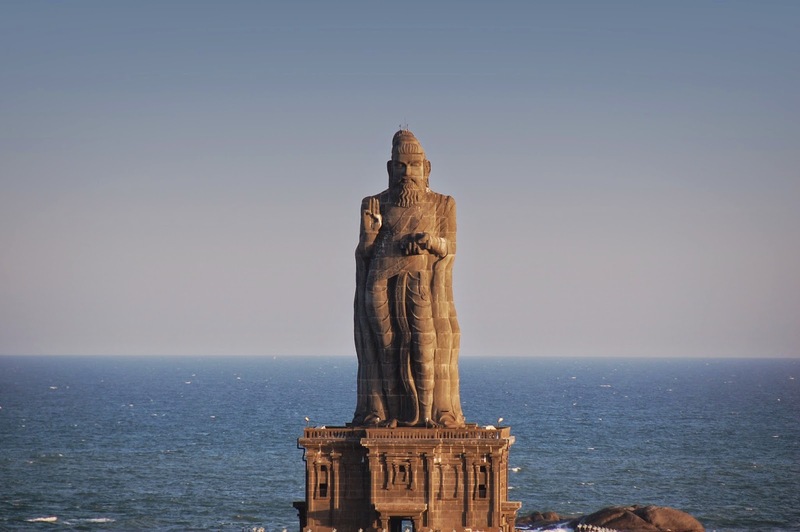 It is situated atop a small island stone, about 400 mtrs away from the coastline of Kanyakumari. its unusual 19 ft high face (including nose, ear, forehead, eyes and mouth) is carved out entirely by hands using a single rock. Vattakottai Fort, also known as the Circular Fort, is a tourist hot-spot of Kanyakumari. 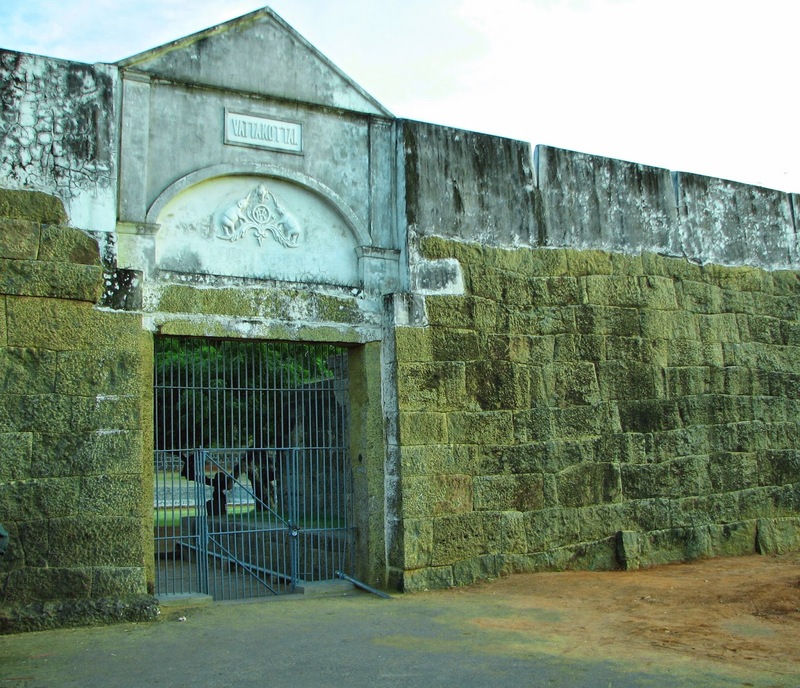 An interesting fact of this fort is that its 4 ft wide tunnel connects it to the Padmanabhapuram Palace. This subway is not in use at present and remains closed. Travel portals in India are in demand as they help overcoming challenges relating to budget accommodation booking, budget flights, holiday packages and best comprehensive online services at one platform in the travel domain. The salient feature of travel portals is that you will save a lot of 'Time' which is more important than money in today's busy life. You can book your journeys anytime and from anywhere online. Now with every thing online, it is quick, easy and more accurate. Image standing in the long queues for booking air and rail tickets but now it happens just on a click of button from home. Salient advantage of travel portals is to easily compare pricing for tickets and hotel rooms from various service providers and select the best suitable. And due to immense competition in the online travel market, travel portals have been formulated to give customers the best deals and lucrative offers to widen their clientele. They also save a hefty fees charged by traditional travel agents that often monopolize their rates. Now-a-days travel portals are making intense efforts to channelize their partnership to uniform into one source including various services and facilities that can be provided to, including their own properties and affiliated luxurious properties. One such Indian online travel portal, that integrates all the travel services and facilities, is www.travelhot.in. It not only books for your travel but also guides you thoroughly allowing you to have an experience and not a just a journey. Travelhot gets you all from the latest updates regarding the diverse cultures, the charming languages, exquisite mountains, delicious delicacies, enthralling deserts, to best time to visit or fun activities to enjoy at amazing places. The portal works more than a guide book ingraining reviews from fellow travelers that you could relate to, you can meet them and hook up with them. Also, you get complete description about places and travelers' ratings so you know where and what you are dealing with. This is like customizing your own holidays where you will be the captain of your travel boat. Online travel portals have revolutionized the way Indians plan their vacations. More innovative concepts and offers are expected from the portals as the market size increases in the coming years.